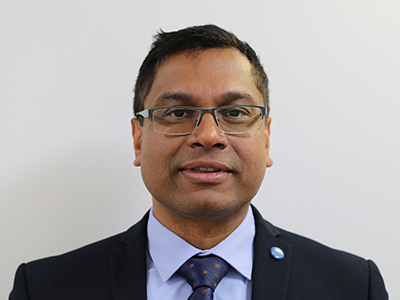 Dr Ramkumar is a Consultant Clinical Oncologist specialising in non-surgical treatment of Head and Neck cancer, Skull Base Tumours and GI cancers since 2009 based in Southampton. He completed Oncology training in India in 1997 and further Clinical Oncology training in Wessex Clinical Oncology Training Scheme, UK in 2009. Dr Ramkumar held several leadership roles in Post Graduate Training (Training Programme Director, RCR College Tutor, RCR Speciality Training Board Member, RCR Curriculum Committee Member, National Recruitment Steering Group, RCR Faculty Board Member) technical Lead roles (IMRT Lead, IORT Lead, Clinical Governance Lead, SRS lead), Management roles (Clinical Leaders Forum Board Member-Genesis Care, UK, Medical Director-Proton Therapy UK) and National e-Proton Steering Group Member. He is Specialist Advisor for Quality Care Commission, Expert Reviewer for National Institute for Health Research Evaluation, Trials and Studies Coordinating Centre (NETSCC), Reviewer for Journal of Clinical Oncology, Senate Member of Clinical Reference Group (CRG) for Complex Head & Neck cancer & National Cancer Peer Review Panel Member (Quality Surveillance Team). Dr Ramkumar is Principal Investigator for several national & International Clinical Trials in Head & Neck cancers. He is project Consultant for LLLT studies at University of Hong Kong. He had pioneered the implementation of Low Level Laser Therapy (LLLT) for treating cancer treatment related toxicities and Intraoperative Electron Radiotherapy (IOERT) for cancer treatment in UK. Dr Ramkumar is Senior Medical Advisor and Lead Clinician-Proton Therapy for Rutherford Cancer Centre South Wales. He has keen interest in improving cancer outcomes and reducing cancer treatment related toxicities. Dr Ramkumar does not hold a share or financial interest in the Rutherford Cancer Centres or another Proton Partners International company. Dr Ramkumar does not have a share or financial interest in equipment used at the Rutherford Cancer Centres or another Proton Partners International company. Dr Ramkumar does not hold any paid advisory role(s) at the Rutherford Cancer Centres or on behalf of Rutherford Cancer Centres or Proton Partners International.